This week marks the start of the new school year. This is also the week that many hundreds of children start their life as students. Among them are two of my nephews. One of them started school at the Tunas Jaya PGGMB School in KB. Apparently he started well, until some kid started to cry and everyone, including my nephew, joined in! When he came home, he complained that school was boring! He skipped his second day at school, as he was unwell. School can't be that bad, eh Boboi? 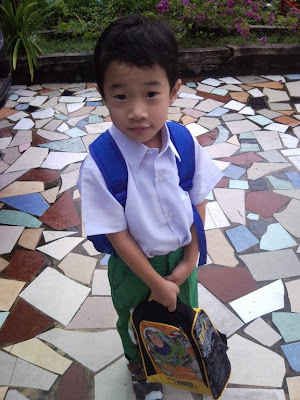 This was him as he started his first day at school.